KIEV, Ukraine -- Clashes erupted Monday when opposition lawmakers broke into the heavily guarded Kiev city council building through windows seeking to prevent what they call an “illegal” session of the local legislature. The lawmakers, led by Batkivshchyna leader Arseniy Yatseniuk, tried to stop groups loyal to President Viktor Yanukovych from holding the session because the council’s five-year term in office had de-facto expired on June 2. But the new election, which would most likely produce an anti-Yanukovych government in the city of Kiev, was postponed by the Constitutional Court until October 2015, or until after the next presidential election in March 2015. Riot police stopped the opposition lawmakers unleashing a fierce attack, including beating several lawmakers in the face, as part of a plan to let the session open, making it legitimate. “Dozens of lawmakers have come today to the council in order to protect the right to Kievites to the election,” Yatseniuk said after the clash with police. The council opened for 10 minutes, enough time to approve five bills, including authorizing the Kiev government to disburse 400 million hryvnias ($49 million) to budget-financed organizations, such as schools and hospitals. Yatseniuk said the fierce attack on the lawmakers by police was a test ahead of upcoming presidential election in March 2015 at which Yanukovych is expected to seek reelection. Due to Yanukovych’s low approval ratings, he will probably lose the election, but will try to manipulate the vote and will use police to quell the people’s protests, Yatseniuk said. 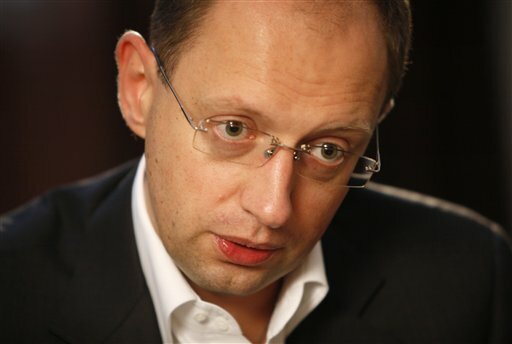 "I do not remember this even during the Orange Revolution, that the police did not allow lawmakers to carry out their duties,” Yatseniuk said. “What happened today is a script for the year of 2015 when Yanukovych will be defending the Central Election Commission when he will be rigging the vote,” Yatseniuk said. The Kiev council voted to approve five bills, including disbursal of millions of hryvnias in state funds to budget-financed institutions, such as schools and hospitals. "Resuming the session of the council is a victory over the destructive forces of Kiev politics," Popov said quoted by his press service. The developments will mostly further escalate as Parliament resumes its session in September and may potentially lead to another political crisis. The opposition groups sought to schedule the next Kiev mayor and Kiev council election on June 2, but the motion was defeated by the Regions Party. The opposition will try to schedule the next elections on October 27, according to a bill submitted to Parliament earlier this year, but will probably also be defeated by the pro-Yanukovych groups.